In the days before weather forecasts, people often turned to sayings and proverbs to provide an indication of what tomorrow's weather might bring. Dating back thousands of years, weather forecasting had to rely less on scientific data and more on human experience. "Red sky at night, shepherds delight" can often be proven true, since red sky at night means fair weather is generally headed towards you. A red sky appears when dust and small particles are trapped in the atmosphere by high pressure. This scatters blue light and leaving only red light to give the sky its notable appearance. A red sky at sunset means high pressure is moving in from the west so therefore the next day will usually be dry and pleasant. "Red sky in the morning, shepherds warning" means a red sky appears due to the high-pressure weather system having already moved east meaning the good weather has passed, most likely making way for a wet and windy low-pressure system. Farmers know that the weather is a significant factor for crops and livestock. The growing season is the phase when temperatures remain above freezing. Temperature, sunlight and rainfall have major effects on their crops. For livestock, temperatures and adequate water and food are essential. Most farmers already know something about the weather, but we can go even beyond that if we get into the science of weather and see how it can help the typical farmer. Weather forecasting is the application of current technology and science to predict the state of the atmosphere for a future time and a given location. Weather forecasts are made by collecting as much data as possible about the present state of the atmosphere, which includes temperature, humidity, wind, and the understanding of atmospheric processes to determine how the atmosphere will evolve in coming weeks. In order to predict the weather accurately for the hours and days ahead, weather forecasters must analyze the information they receive from number of sources – including local weather observations, weather balloons, weather stations, satellites, and now drones. Measuring how efficiently water is used in agriculture, particularly in water-scarce countries, a new tool was developed by the Food and Agricultural Organization (FAO). Using the WaPOR open-access database, farmers can tap satellite data to help farmers achieve more reliable agricultural yields, allowing for the optimization of irrigation systems. WaPOR sifts through satellite data and uses Google Earth computing power to produce maps that show how much biomass and yield is produced per cubic meter of water consumed. The maps can be rendered at resolutions of as little as 30 to 250 meters, and updated every one to ten days. Climate forecasts can be placed into two broad categories—statistical and physical. Statistical techniques rely on historical climate data to establish relationships between different time periods. A statistical climate prediction can be developed for summer temperatures based on winter temperatures. If winter temperatures are above normal, the odds for a warm summer increase. 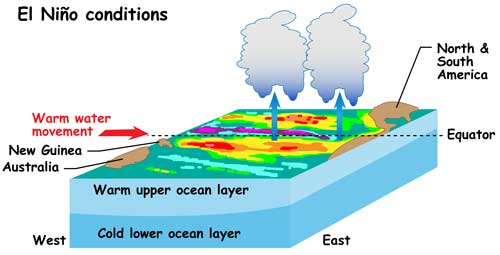 By contrast, physical prediction techniques rely on known causes of climate variations. A prominent example is the El Niño, a periodic disruption of the ocean and wind currents in the equatorial Pacific Ocean, which also influences the United States. An El Niño event occurs about every 4 to 7 years and lasts for about a year. Since 1995, the National Weather Service has produced climate predictions of temperature and precipitation out to a year in advance. They use both statistical and physically based techniques to develop their predictions. Their techniques include running global climate models, examining similar conditions in the historical record, and considering recent trends in temperature and precipitation. The National Weather Service launches hundreds of weather balloons twice daily to record temperature and other data used in weather forecasting. These balloons can study the vertical expanse of the atmosphere, but drones can collect much more data in the part of the sky closest to where humans live. Agriculture satellites are used around the world to help assess crop health, yield, and facilitate environmental analysis to ensure farmers have all the details they need to best manage their farms. Imaging systems like Normalized Difference Vegetation Index are effectively special visual sensors pointing down at the ground. The different colors in the image tell a different story about what is happening with a farmer’s crops. Already, agriculture-ready drones are popping up for purchase, for the farmer who wants to use technology to gather information on his crops. A drone called the HoneyComb makes use of the same exact NDVI technology normally found on satellites. Now, drones are flown into the atmosphere to uncover meteorological secrets critical to improving weather forecasts. These drones could sample the atmosphere in difficult to reach, remote locations where weather data is scarce. The data received could then be integrated into prediction models, improving their resolution and reliability. Research facilities at multiple agencies and universities have been testing methods for using drones in meteorological data collection for years, but operational drones for weather analysis have only started flying recently. The Earth's atmosphere has layers like a cake. Forecasting the weather is more accurate if information comes from a lot of sources and from all of those layers. That is why we have weather satellites, high-flying drones and weather balloons, all operating at different altitudes. Scientists at Oklahoma State University are developing new drones that will help forecasters operate at all the different levels, which should increase the quality of computer models that are tracking local weather patterns. Atmospheric measurements provided by radar, weather balloons and towers are good for forecasting a few days ahead, but not so good at predicting dynamic, hour-to-hour weather changes. Drone flights can be extremely important in places prone to sudden, violent storms.